Parking is very limited on Harbor Island and will be full by early afternoon. Please be patient. We strongly encourage you to use our transportation partners. 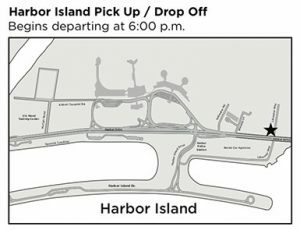 Harbor Island Pick Up / Drop Begins departing at 6:00 p.m.
For shuttle service to Harbor Island, park at the Airport Long Term Parking Lot at the corner of North Harbor Drive and Liberator Way, east of Airport Terminal 1. Pickup will be at this lot. Passengers will be dropped off at the San Diego Harbor Police Headquarters, at the corner of Harbor Drive and Harbor Island Drive. The last shuttles run at 10:45 p.m. 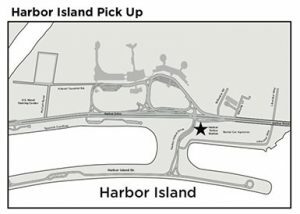 There is one pick-up spot on Harbor Island. 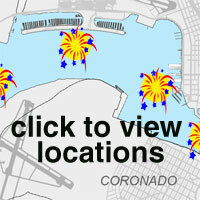 The pick-up point is adjacent to San Diego Harbor Police Headquarters at the north end of Harbor Island at the corner of Harbor Island Drive and Harbor Drive. The first shuttles will leave shortly after the fireworks show. Please be patient while waiting for additional shuttles as the wait time may be significant.